Avocado seeds are relatively easy to sprout and is a great project for kids. Keep in mind that trees grown from seed often aren’t as productive as the tree the fruit was taken from. Orientate the seed so the more pointed end is facing upwards and insert four toothpicks around the middle of the seed. Push the toothpicks in far enough that they feel stable. Place seed on a jar, or glass, of water with the tooth picks resting on the rim, ensuring the bottom half of the seed is submerged. Sprouting can take between 2 and 8 weeks. Ensure the bottom of the seed remains in contact with the water by topping up the water in the glass as required. Once the sprout reaches about 20cm pot in soil. Find a sunny location to plant the tree where the soil is not prone to flooding or dampness. Dig a whole large enough to fit the root system. Check the depth of the hole is correct by placing the tree, still in it’s bag, into the hole. The top of the potting mix should sit 1 – 2cm above the level of the surrounding soil. Wet the soil around the hole prior to planting. Still in its plastic wrap, place the base of the tree into a bucket of water and fully submerge for a few minutes until all the potting mix is soaked. DO NOT leave the potting mix submerged in water for prolonged periods as this will drown the tree. Cut off the base of the bag and remove it being careful not to cut the root system. Cut along the side of the bag from the base but not quite to the top. Place the tree and bag into the hole and orientate the tree so that most of the leaves face north to shade the trunk as much as possible. When settled carefully fill the remaining space around the outside of the tree with soil, sliding the bag upwards as the hole is back filled with soil. Be very careful not to damage the roots as they are very fragile. Sliding the bag up as the hole is filled will ensure the potting mix doesn’t fall away from the roots. You must ensure that you don’t leave major air spaces as roots won’t grow in these. Once you have filled the hole, gently pat the soil with your hands to settle it firmly around the potting mix. Avoid stamping the soil too firmly or with your feet as this can damage the roots and avocado roots like loose soil to grow into. 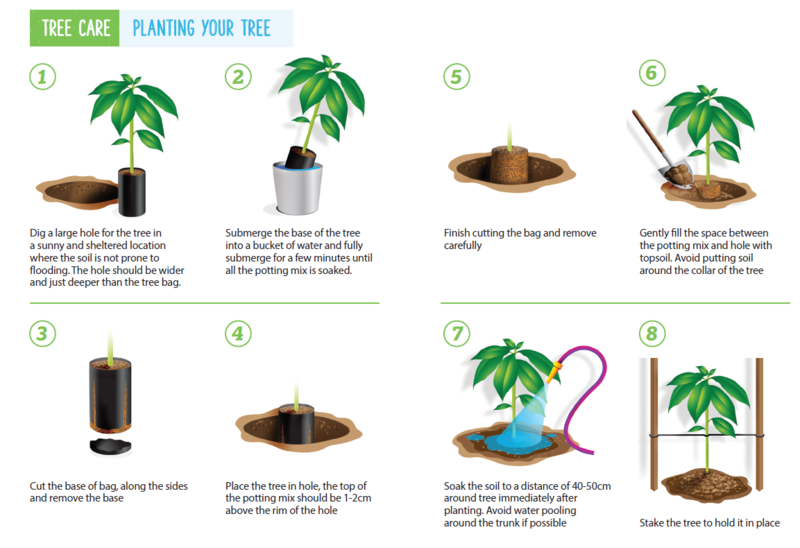 Tree should be soaked as soon as possible after planting, however, to avoid rots, it is important that water does not form a puddle around the collar of the tree. In the early planting and establishment phase a stake is usually used to hold the tree in place. Place the stake facing the prevailing winds so that the wind pushes the tree away from the stake. Ensure the stake is hammered into the ground outside the trees root system. It’s also recommended to create a shelter using 4 battens and some shade netting. Individual shelters are usually constructed from 50 by 50 mm ground-treated battens forming a 1.25 m square with shade cloth on the four sides. This will allow adequate protection for one to two full growing seasons. The height of the battens should be 1.5 to 2.3 m long, which allows for 30 to 50 cm burial of the batten and 1.2 to 1.8 m height for the shelter. The enclosure should reach the ground to prevent damage from rabbits, hares, possums or beetles. The shade cloth is usually stapled to the battens leaving one side that can be unhooked for access. Keeping the right amount of water in the soil for these young trees is not easy and is crucial. You must apply enough water to wet the surrounding soil to a distance of at least 40 to 50 cm from the potting mix. Once this volume of soil is wet you must stop the irrigation and allow for excess water to drain. As a general rule, with avocados in New Zealand conditions, it is better to do large infrequent irrigations (e.g., 50 litre per plant every 10 days) than small frequent irrigations (e.g., 5 litres per plant every 2 days). Irrigation in the first weeks will probably be more frequent because most of the roots (all of them for the first days) will be in the potting mix which can dry very fast. As roots start to grow into the soil around the potting mix (which can happen as soon as 4 to 5 days after planting if soil temperatures are high), irrigation events can be less frequent. Fertilizer must not be added directly into the hole at planting. It is better to add the fertilizer mixed very well with the soil that will be used to refill the hole (remember, only slow or controlled release fertilizer and always in small quantities, never more than a very small handful). Foliar feeding (leaf sprays) with a balanced liquid fertilizer (contains mixture of N. P. & K) for 1-2 months after planting can help with tree establishment. Thereafter granular fertilizers can be applied to the soil 40 cm around the stem, being careful to avoid contact with the stem. Continue with foliar feeding monthly with liquid fertilizer and Zinc (2 g Zinc oxide/litre of water). Boron (1 g Solubor per litre of water) should be applied every two months. Half the fertilizer in winter. Increase the quantity of fertiliser as the size of the trees increases. There are no set rules when it comes to pruning avocado trees. Your pruning should aim to maximise the amount of light the tree gets and also manage tree size and shape. Deadwood removal at any time is encouraged and major structural pruning in summer should be avoided to prevent sunburn. Once fully established, mature trees water requirements can be often be sufficiently met by New Zealand’s high annual rainfall unless soil is particulary free draining. However, irrigating your tree during a dry period might be beneficial. When watering your tree, soak the soil inside the dripline well and then allow it to dry out before watering again (7-10 days) to maintain good soil aeration. Mulching around the base of the tree is encouraged and can help conserve water, improve root growth, provide nutrients , reducing stress on the tree and suppressing weeds. Avocado specific granular or general garden fertilizers can be applied under the canopy of the tree. With growth in tree size the quantity of fertilizer will also need to increase. The nutrient requirements over winter are much less than Spring – Autumn. Avocados typically follow an alternate bearing pattern. This means they will have lots of fruit one year and very little the next. A grafted avocado tree from a reputable nursery should start producing fruit from year three onwards. Avocado trees grown from seed may produce fruit after about 3 years, may take 12 years or more, or may not ever produce fruit. This is due to the variable nature of the genetic makeup of trees grown from seed. There are many environmental reasons that trees may not produce fruit such as cold temperatures, dry or excessively wet soil, root rot and pruning faults. Avocados are unusual as they do not ripen on the tree, they only ripen once they picked. If they are picked before they are mature avocados will remain rock hard and never ripen. The best way to find out if your avocados are ready to be picked is to pick one, if it ripens within two weeks then the rest should be ready too. If it doesn’t ripen then keep checking every couple of weeks. The main harvest season for Hass avocados (the main variety) in New Zealand is September to April. Do I need both ‘A’ type and ‘B’ type trees? No, over the flowering period avocados flowers open as both female on day one and male on day two. There is often a crossover period during the day where both male and female phase flowers are present, providing the opportunity for pollination to occur ‘A’ type avocado trees typically open as female in the morning of day one and male in the afternoon day two. ‘B’ types do the opposite and open as female in the afternoon on day one and male in the morning of day two. Having both ‘A’ and ‘B’ type avocado trees can increase the overlap time of male and female flowers increasing the opportunity for pollen transfer and pollination. How many fruit will a mature tree produce in one year? The number of fruit a tree produces can vary greatly from season to season. Weather, tree size, nutrition and the previous seasons current crop load can all influence return flowering and the amount of fruit in a season. A well-resourced 6-7 year old tree in the right climate and environment with little fruit can produce in excess of 400 pieces of fruit. A grafted tree might flower and produce fruit as early as year two. Trees grown from seed are incredibly variable and therefore might not ever produce fruit. How long will my avocado tree produce? Your avocado tree will remain productive and continue to grow until something kills it. The original Hass mother tree was planted in the 1920’s and survived until 2002 when it succumbed to root rot. How big will my avocado tree get? Dependent on the trees environment, left to grow Hass avocado trees will get up to 15m+ tall and equally as wide. Regular pruning can help keep the tree to a manageable size.